The Clifton Opera House hosts the Ivory Doghouse on Friday , April 12th at 7:30pm. They will be "Boogying the Blues" and rocking the house. The box office will open at 6:30pm, show starts at 7:30pm. The Ivory Doghouse is a “variety band” in the truest sense of the word. 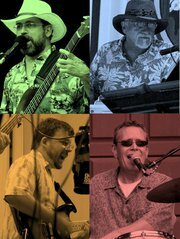 The musical talents of Joe Hochadel (vocal, bass, & saxophone), Lou James (keyboard), John Simon (guitar, bass, & vocals), and Tom Ellis (drums & vocals) combine on stage to create an exciting sound that highlights the amazing versatility of the band. Concert performances feature styles as varied as jazz, blues, country western, and rock & roll, and the band’s repertoire spans every decade of the 20th century through the hits of today. Boogying the Blues will feature songs from artists like Stevie Ray Vaughn, Lynrd Skynrd, Chuck Berry, Toby Keith, and Delbert McClinton and will showcase both Lou James and John Simon. And, since The Ivory Doghouse likes to perform songs that are special to members of their audience, as always, they will mix a number of requests from the audience into their scheduled program. Join the Ivory Doghouse for an evening of Boogyin’ the Blues at the Clifton Opera House ! The Clifton Opera House is located at 5 So Clay Street, Clifton. Call 767-2343 or 342-2175 for information. Door donation $7.00. We are air conditioned and handicap accessible.